Jetty is on his way back from a tropical kiteboarding vacation in Exuma in the Bahamas and I hope he had good winds but a few weeks ago we had a pretty fun snowkiting session right here at City Beach in Grand Haven. The cold weather we’ve been having froze over the first couple hundred feet of Lake Michigan shoreline so there was enough real estate right on the beach to go snowkiting. At 8-10 knots the wind was extremely light that day and at times on the ground it felt like there was no wind at all. 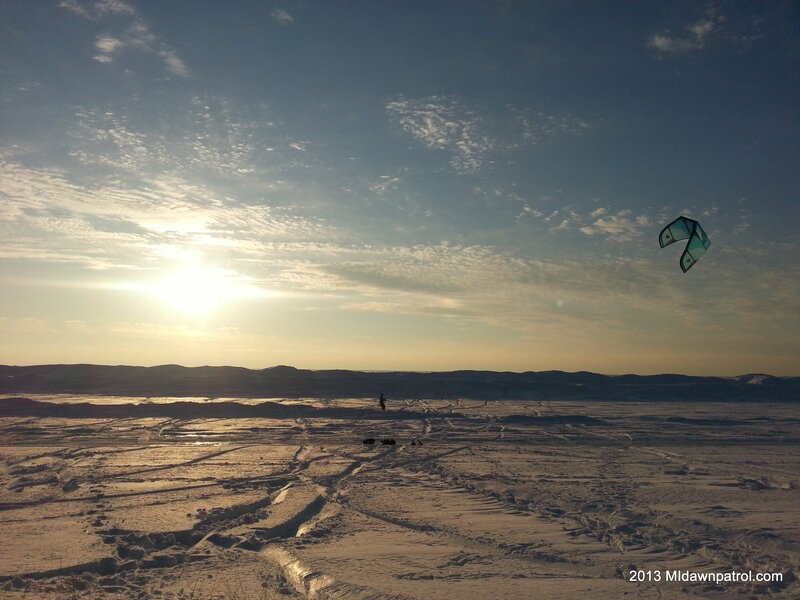 The sun was out, it was relatively warm, and we were itching to try snowkiting again so we set up my 15 meter Naish. I decided to give it a try first and strapped into my snowboard as Jetty launched the kite. I pulled down on the control bar to check the power in the kite and it felt light. Would I even be able to move? I cranked on the left side of the control bar and was suprised that my 225 lb frame was actually gliding across the snow. It became clear that although I was able to enjoy the ride there was no way I was staying up wind. Looking west towards Lake Michigan there were some ice formations and one of them closer to the shore created a small kicker. After a few tacks my confidence was built up enough to try going over the first iceburg towards the lake to extend my ride. I had to laugh at myself as I tried to go back the other way towards shore and couldn’t build up enough speed to get back over the small iceburg. After flopping around on the ground I finally made it over and continued my way down wind. After walking back upwind with the kite and my snowboard I was breathing pretty heavy and ready to let Jetty give it a go. The wind was still light but he was able to stay up wind and even attempt to boost. He did get off the ground and even though the teenagers walking by snickered a little I thought it was pretty sweet. We traded taking turns on the kite until the wind wouldn’t keep it up in the air any more. With the sun and fresh snow it was a fun session. The dense cold air kept the kite powered at wind speeds that in the summertime would have made kiting impossible. I’m looking forward to getting out snowkiting Grand Haven or somewhere else at least one more time before Spring starts melting the iceburgs enough to make a path to the water.